Washington, Jan 30 (IANS) An Indian-American woman in Florida is under arrest after admitting that she shot dead her 17-year-old daughter, a high school student tipped for a bright future, in an apparent murder-suicide bid. According to the arrest affidavit, Sujatha Guduru, 44, shot her daughter Chetana Guduru twice, fearing there would be no one to care for the girl after the mother’s suicide, www.myfoxorlando.com reported. 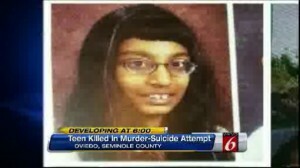 Chetana Guduru, a pupil at Seminole High School in Orlando, Florida, was found mortally wounded Monday morning in her mother’s bed, dying a few hours later at Orlando Regional Medical Centre. The distraught, suicidal mother admitted to police in Oviedo, a small town in Florida, that “she intended to commit suicide and that she did shoot her daughter as well,” Lt. Mike Beavers was quoted as saying. Police believe Sujatha had been planning the murder-suicide for weeks, recently buying a .38 caliber revolver, writing a last will, and detailing her plans in an email to her brother. He didn’t see it until it was too late. Chetana’s father, Rao Guduru, was not home at the time of the incident and drove Monday from Atlanta to be with his family, the Orlando Sentinel said. Police are still looking for answers as to why Guduru allegedly killed her daughter, then turned the gun on herself. Oviedo Police said Guduru will survive, and she was being guarded by Orange County corrections officers while she recovers at Orlando Regional Medical Centre. Once she is medically cleared, she will be taken to the Orange County jail on first degree murder charges and then extradited to Seminole county. Website wftv.com cited defence attorney Robert Buonauro as saying there will most likely be a competency hearing for Sujatha Guduru and that it was unlikely she will go to trial. “If she is incompetent to proceed and then the experts indicate she was legally insane at the time of the act, there is a good change this case won’t go to trial,” Buonauro was quoted as saying. According to the Sentinel, Chetana’s academic talent earned the Oviedo girl acceptance into a variety of colleges, but it also garnered the admiration of her Seminole High School fellow seniors. The school is asking students to wear purple – Chetana’s favourite color – to school Friday in her honor, it said.